Peanut arrived at the PRC after being purchased by an undercover agent during a drug operation in Rowan County Kentucky. At first, Peanut showed visible signs of neglect and isolation (rocking, poor nutrition and health, etc.). 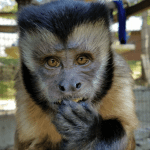 However, she quickly responded to our rehabilitation efforts and made fast friends with Grady capuchin once she was introduced to our capuchin group.